a one year internship with famed New Orleans Jeweler, Henry Baudin. Meadows' skill develop rapidly and naturally and in the middle of the 1975 recession, he decided to strike out on his own. Now, 40 years later, we are still thriving as one of Pensacola's leading jewelers. "We believe the key to our success is that we do our utmost best to educate both our clients and our staff. When you purchase a piece of fine jewelry from us, you will know exactly what you have and why it is priced as it is. Our business philosophy is simple: Do what's right; give it your best; treat others the way you would like to be treated!" As a family operated business, we take pride in our work, from the workbench to the showroom. It is our job to assist and educate our customers from start to finish in their jewelry or diamond buying experience as well as explaining why and what needs to be done to properly repair their jewelry. Our niche is customer service! We will not be satisfied until our customers receive exactly what they are looking for and since our employees do not work on commission, you can be assured of the same courteous service whether you are looking for a battery replacement or a diamond engagement ring. While most jewelry stores focus mainly on sales and then start a repair business as a supplement, we have taken a totally opposite approach. 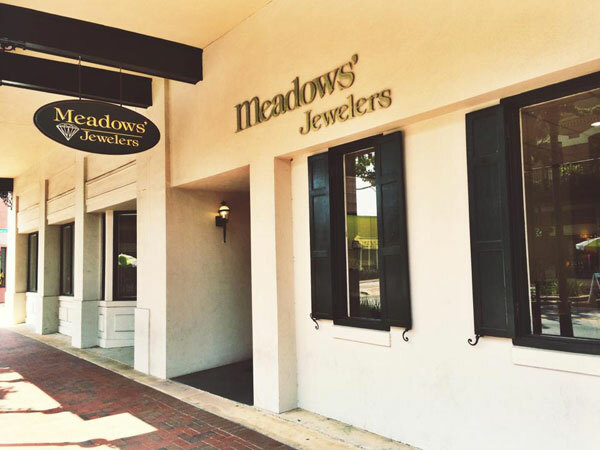 Since Meadows' was founded by a "bench jeweler", we have always been intensely focused or repairs and custom designed jewelry. As you can imagine, it was quite difficult for a new store to become an immediate success, so our early focus on doing repairs that others could not, or would not tackle became our niche. As word got out that we were the ones to see for difficult repairs, other stores began to ask us if we would do their repair work for them. This lead us into a very strong posture in what is called "Trade Work". This catapulted us into being the largest trade shop in Northwest Florida, doing repairs for as many as twenty other stores, ranging from independent jewelers, to Department stores, to national jewelry chain stores. It is because of this type work that we believe our store has repaired more pieces of jewelry than any store in the long history of Pensacola, Florida, and, that individually, Bob Meadows has repaired more jewelry than any single person since de Luna landed here in the 16 century. Many days during the months of December and January, we will size or do other repairs on more than 100 rings. The reality is, that if you have had repair work done at any shop where there is not a jeweler on the premises, it is quite likely that your repair was done at Meadows' Jewelers. In 2004, we became one of the first shops in West Florida to purchase a state-of-the-art "Laser Welder", which enables us to do many intricate and difficult repair tasks. Using this laser welder eliminates the use of solders, which contaminate such precious metals as platinum. It also allows us to perform many repairs that could not be completed with the traditional jewelers torch because of the tremendous heat requirements.